My computer has been giving me fits lately, so while waiting for my hubby to work on it, I decided to get some painting done. While browsing some blogs lately I've noticed several kitchens done in white, yellow, and lots of red. So, I was inspired to paint this cupcake painting in these colors. I listed this painting on eBay last night and it would make a lovely Valentine's Day gift for that special person in your life or for yourself. 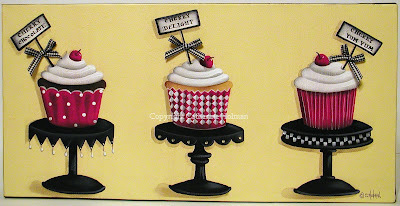 This painting of three charming cherry cupcakes would be a great way to brighten up your kitchen. All three cupcakes are in coordinating red and white cupcake liners and are topped with fluffy white butter cream frosting and a single cherry. The three cupcakes are "Cherry Chocolate", "Cherry Delight", and "Cherry Yum Yum". Each cupcake rests on a decorative black cake stand with it's own unique style. Tiny little black and white checked ribbons are hot glued to the stick section of the labels. I've also attached a black and white checked ribbon to the edge of the canvas. I've photographed this painting with and without the ribbon on the edges. It can be removed if you prefer. Above you can see this painting sitting on my red roller skates next to the Valentine Cupcake painting that ends this evening on eBay. Here's a final look at the "Be Mine Valentine" cupcake painting before it skates off to its new owner at the end of the auction. This week I cleaned all the Christmas artwork off my chalkboards and here is a sweet little surprize my hubby left me. I love it that he still does these little things after 36 years! 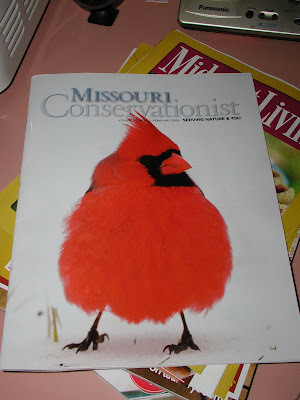 The Missouri Conservationist magazine arrived in the mail this week and I just had to share the beautiful photo on the cover with you. I love the contrast of a brillliant red cardinal against the glistening white snow. that cupcake painting is too cute! Love the black in there too. What a sweet husband you have, hope mine still does those things when we are married 36 years. That is a nice red cardinal with the snowy background. What a sweet painting! I hope that someone very special wins the bid. The cupcake painting is so sweet!! And your hubby is a sweetie for leaving you that note! You had me at "Valentine"! Just looking at your work makes me feel happy! How adorable that your husband surprised you with that message! Very sweet! I love everything you do but this bright colors really do stand out! Love the sweet message you got from hubby and the magazine cover! Red is my color here lately! I just love that sweet painting. It is so great. Fantastic painting! That is a really cool magazine cover! I love the cupcake painting but I also adore the idea of the skates. So very clever! 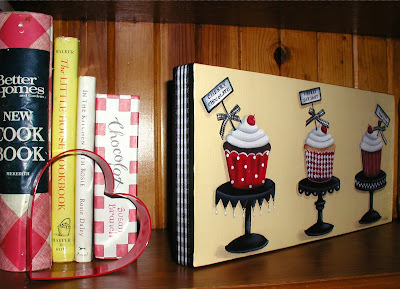 Love that cupcake painting...beautiful in any kitchen for sure. The paintings are so cute. I love them on the skates. I can almost feel those skates clamping into my Keds now. Those were the days. The photo of the cardinal is great. We don't have cardinals around here. Wish we did. They are so pretty. Have a happy weekend. That's so sweet that your hubby left you a littl message! It makes my heart melt when mine does stuff like that. And the painting is so cute! I love looking at all the details you put into them! Such adorable cupcakes! 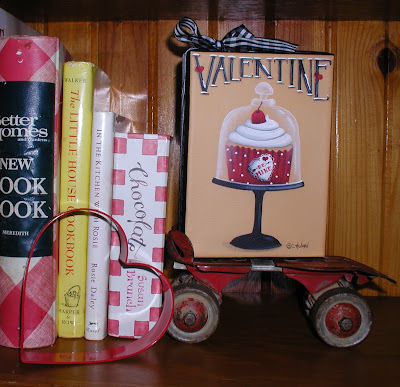 I have a personal love of red and white (that's why MY kitchen is in those colors) and you've done them in such an adorable way! I also like how you've stage them for photographing with the cute vintage skates. Cathie, living on the KS plains now, we still receive the Missouri Conservationist, and a couple of my boys thought I was never going to stop blathering about the beauty of this month's cover; breathtaking really. Cathie, we had to go out of town before the auction ended for the Be My Valentine 5 x 7 cupcake so of course I wasn't the winning bidder. Any chance you might do another like it? I noticed that you have the print listed now but I would love to get an original. Is it possible to just order one and send you payment through PayPal? Hope you don't mind me leaving this as a comment. Well of course I love your adorable new cupcake painting - too cute! 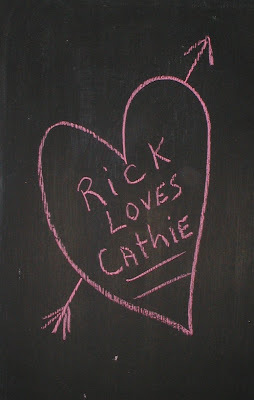 I also just love what your hubby left for you on that chalk board. How romantic! I love the cupcakes, such wonderful colors! And what a sweet husband you have. You cupcakes are delightful! great job I love red and it goes with yellow. !